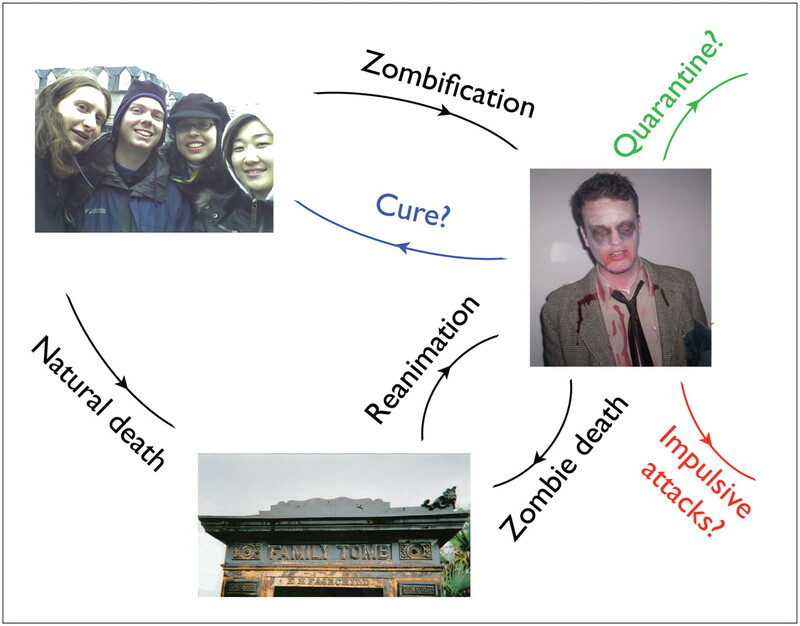 A mathematical model for zombie infection 8 was quickly designed (Figure 1). As shown by the model, humans could be infected by contact with a zombie, whereas zombies could be created either through the conversion of humans or reanimation of the dead. The model assumed that zombies could be killed in encounters with humans, as often happened when humans ran over zombies in their cars. Initially, such deaths were assumed by authorities to be part of a concerted effort at eradication of zombies, but were later revealed to be simply a result of rush hour. Some drivers were surprised when these recently deceased zombies returned to life and attacked them. Other drivers simply handed the zombies some spare change and waited for the reanimated creatures to clean their windshields. Simulations based on a city of roughly 500 000 people demonstrated that an entire such city would be replaced by zombies after about four days (Figure 2A). Were this mass replacement of a population to occur in a city such as Ottawa, it may be unlikely anyone would notice. Nevertheless, nearby cities such as Montreal would no longer be in the bagel-supplying business in such a scenario, and that result would be serious. Figure 2: Projected population dynamics (based on type of intervention) in the context of a zombie outbreak. In the basic model (A), zombies eradicate humans after 4 days, leaving nobody to host daytime variety television shows or stop you from entering nightclubs (i.e., no loss there). (B): Quarantine delays the inevitable. Slightly. (C): A cure allows zombies to live in harmony with humans, which would be more fun for zombies than humans. (D): Only episodes of blind, aggressive, unfeeling violence are effective. And that’s just on the part of humans. Image courtesy of Nova Science Publishers Inc. Given this model, even a small outbreak would lead to a collapse of society as we know it. Explaining to the mathematicians that this outcome might be a bad thing took time because, initially, they were not able to see the downside. However, they were quickly mobilized after realizing their supply of caffeine and science fiction DVDs would dry up. Three interventions were proposed. The first was quarantine (Figure 1, green arrow), whereby a small proportion of the zombies would be kept in isolation. But given that the infection was so virulent, even leaving a few zombies in the wild would result in a restart of the outbreak. Including quarantine thus made no difference to the stability of the doomsday equilibrium (Figure 2B). That was a bit of a downer, to be honest. The second intervention was a theoretical cure that would convert zombies back into humans (Figure 1, blue arrow). Although the mathematicians were reminded that such a cure was entirely theoretical and likely could not be developed within four days, they were quite taken with the idea of proving results based on things that couldn’t possibly exist. This response was annoying, because they should have been concentrating on zombies instead. With a cure, humans and zombies could coexist. But unless the cure were 100% effective, humans would survive only in small numbers (Figure 2C) — most likely in shopping malls, abandoned farmhouses or the Winchester pub. Finally, the idea of impulsive attacks was considered (Figure 1, red arrow). This intervention would involve an escalating series of discrete attacks on the zombies, using an advanced mathematical theory called impulsive differential equations. These equations are similar to ordinary differential equations, except that sometimes they jump up onto tables, paint themselves purple and start singing show tunes for no reason whatsoever. The projected outcome of this intervention was more promising. 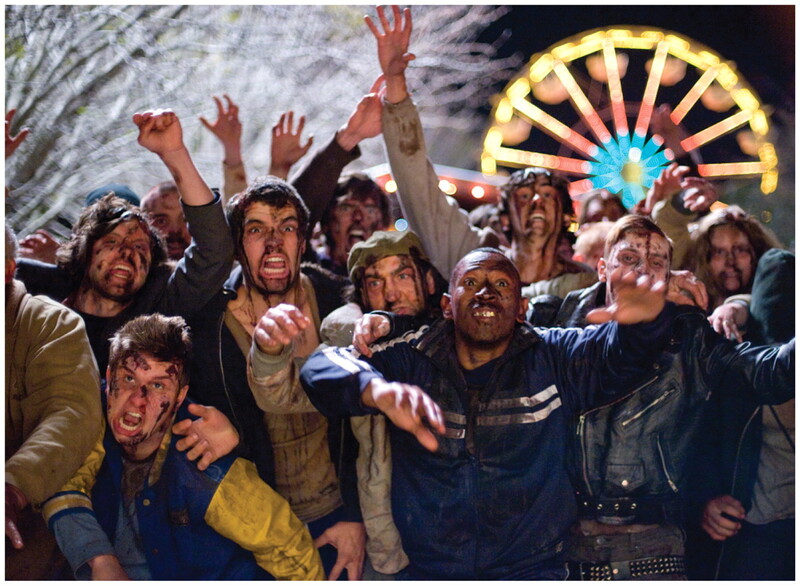 At regular intervals, humans would mobilize their resources and attack the zombies. Each attack would be carried out with more force than the last one. The humans would keep fighting with increasing intensity until either the zombies were destroyed or the humans were torn apart from limb to limb and their flesh consumed by the ghoulish undead. Still, you’ve got to laugh, haven’t you? If humans could manage these impulsive attacks, the zombies could be destroyed after 10 days (Figure 2D). The overall model had limitations, of course. The numerical contributions of natural births and deaths had been ignored because of the brief timescale involved and the unlikelihood that mathematicians would be engaged in breeding. Inclusion of population demographics in the model suggests a limitless supply of new bodies would be available for zombies to infect, resurrect and convert. We must therefore act quickly and decisively to eradicate zombies before they eradicate us. Mathematical modelling suggests that several potentially promising avenues of intervention against zombies would in fact be useless. Neither quarantine nor a cure are viable options and would only delay the inevitable by a few days. The best option remains arming oneself to the teeth, hitting the zombies hard and then hitting them harder the next time. The 2009 epidemic was successfully contained using this last option. When the next zombie outbreak occurs, rapid management of the spread of infection is imperative. Should we be unable to contain the outbreak, we face the extreme possibility of a world whose population is made up entirely of mathematicians and zombies. One of these groups spends all its time lurking in the darkness, with wild eyes, hair askew and brains that don’t work like those of normal humans. And the other group is the zombies. Acknowledgements: The author is supported by an NSERC Discovery Grant, an Early Researcher Award and funding from MITACS. So huge truckloads of taxpayer money were spent on research that involved capturing zombie specimens and travelling to exotic locations to observe zombies in the wild. Numerous lavish lunches were also consumed along the way, but none involved the brains of the living. Honest. Scriber B. What can zombies teach us about swine flu? [blog]. National Geographic Magazine 2009 Aug.12. Available: http://blogs.ngm.com/blog_central/2009/08/what-can-zombies-teach-us-about-swine-flu.html (accessed 2009 Oct. 22). Smith? R. Zombie math and swine flu. Ottawa Citizen 2009 Sept. 12. Available: www.ottawacitizen.com/health/Zombie%20math%20swine/1986332/story.html (accessed 2009 Oct. 22). Chase S. Scholars put braaaaains together to thwart zombies. Globe and Mail 2009 Aug. 15. Wallace K. Mathematicians use zombies to learn about swine flu. Toronto Star 2009 Aug. 18. Available: www.thestar.com/article/682691 (accessed 2009 Oct. 22). Goldstein J. What’s the best way to fight zombies? Someone did the math. Wall Street Journal [NY] 2009 Aug. 18. Available: http://blogs.wsj.com/health/2009/08/18/whats-the-best-way-to-fight-zombies-someone-did-the-math/ (accessed 2009 Oct. 22). Ghosh P. Science ponders ‘zombie attack’. BBC News 2009 Aug. 18. Available: http://news.bbc.co.uk/2/hi/science/nature/8206280.stm (accessed 2009 Oct. 22). Hanlon M. Forget swine flu — could we cope with a plague of the Undead? Scientists ponder the threat of a zombie attack. The Daily Mail [UK] 2009 Aug. 26. Available: www.dailymail.co.uk/sciencetech/article-1209052/Forget-swine-flu-cope-plague-Undead-Scientists-ponder-threat-zombie-attack.html (accessed 2009 Oct. 22). Munz P, Hudea I, Imad J, et al. When zombies attack! : Mathematical modelling of an outbreak of zombie infection. In: Tchuenche JM, Chiyaka C, editors. 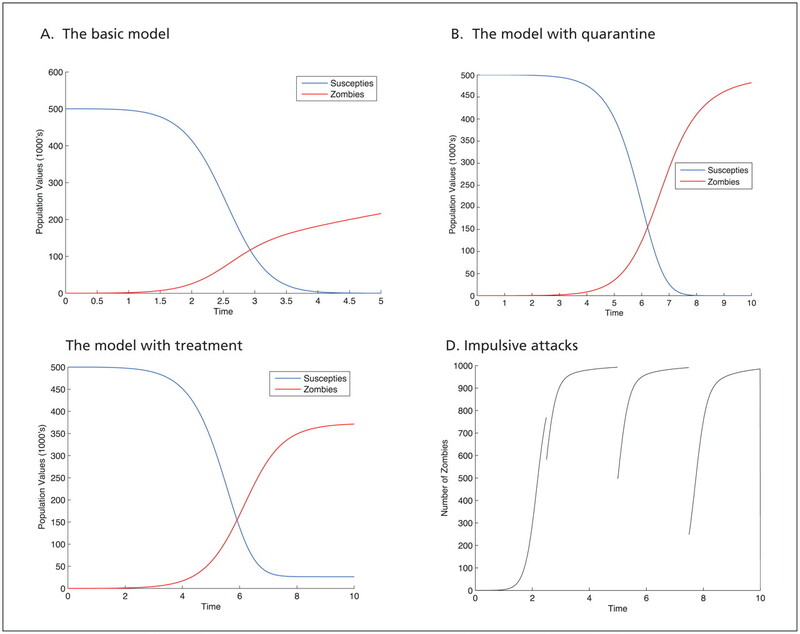 Infectious disease modelling research progress. Hauppauge (NY): Nova Science Publishers; 2009. p. 133–50. Available: www.mathstat.uottawa.ca/~rsmith/Zombies.pdf (accessed 2009 Oct. 22).